This festive and delicious eggnog punch is extremely simple, yet so good! Your guests be asking you for your recipe! 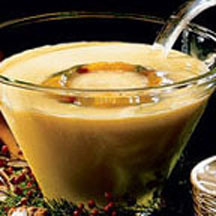 Combine eggnog and nectar in a large punch bowl; mix well. Ladle into frosted mugs; garnish with a dash of nutmeg. For optional ice ring, fill a 4 cup ring mold halfway with water; freeze until solid. Arrange apricot halves, mint sprigs and cranberries attractively over ice. Drizzle with 1 cup cold water. Freeze until fruit is frozen. Unmold and float in punch.